For this Friday’s sky watch I had to once again rummage through my old folders. 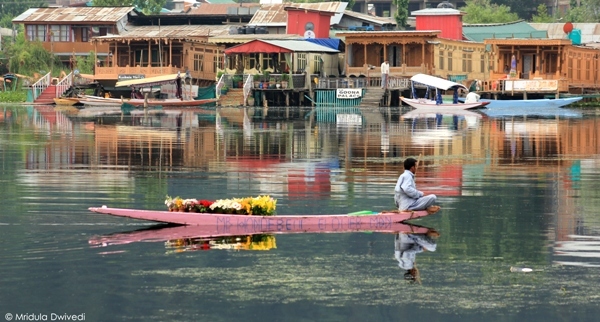 I went to Srinagar twice this year, one in June and once in September. And I was almost caught in the floods in September. 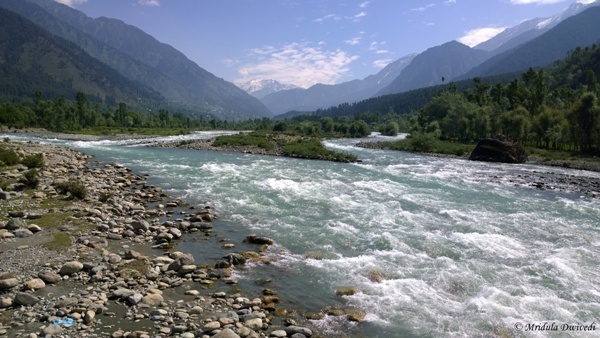 In all I have been to Kashmir three times now. But I still feel I have seen too little of the region. How I wish I could say that took this picture while around the lake. The truth is I was stuck in a traffic jam by the lake when I clicked this picture. I clicked it sitting in the vehicle itself, on my cell phone! When I actually walked around the lake, it was during the day when the sun was harsh and pictures quite flat. When the light was good I was stuck in a traffic jam! How do you react when you find yourself unable to take pictures properly when the light is good? I sulk quite badly and it happens to me so many times. 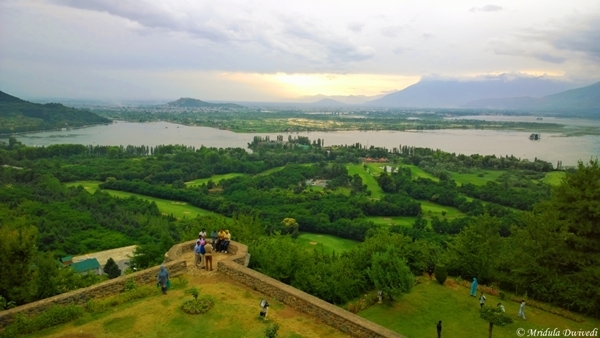 The view of Srinagar from Pari Mahal is awesome. Pari Mahal is actually a garden rather than a mahal (palace). In a way I envy the couple, sitting with each-other with such a fabulous view in front of them! They so seem to be into the scene and enjoying each-other’s company. No worrying about manual mode and camera settings for them! If you are fond of clicking pictures, do you ever feel that you are almost always chasing pictures instead of enjoying the scene? Do you ever put down the camera to enjoy the moment? If yes, how do you manage to do that? You have to tell me the secret. Sunset and sunrise are usually the times when magic happens in the sky. I am guilty of sleeping through way too many sunrises, in fact almost all the sunrises in the recent times. However, if I am out at sunset I do try to enjoy those magical hours. 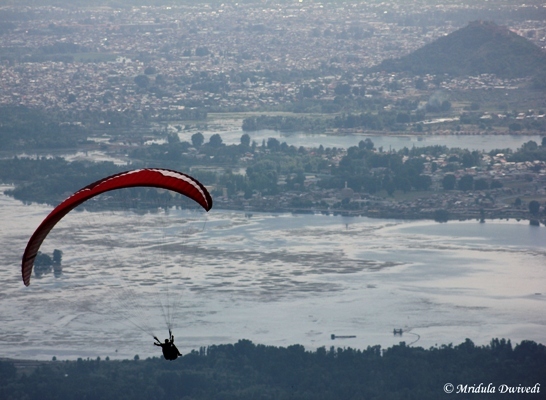 In Srinagar I was lucky on my first evening itself. 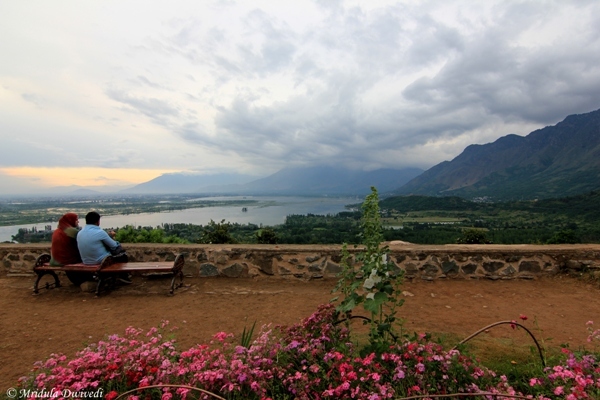 We were visiting Pari Mahal which is a multi-terraced garden with an out of this world view of Srinagar city along with the Dal Lake. When I have just one shot at photographing something I am often torn with conflicting emotions. I was not sure if I was happy with the clouds or not. I kept thinking about the gold in the water and how it would look if it was a clear day. Can you imagine the above scene at sunset on a clear day? I wondered if that would have come out much better? But then the clouds and the nature gives too hoots about how many times I get to photograph a place, so I get what I get! 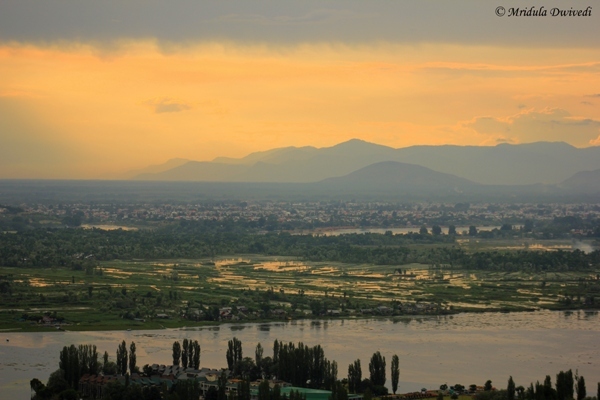 In June the sunset at Srinagar was at 7.45 pm. I initially thought my app, which tells me about sunrise and sunsets across the world, was wrong but as usual it was accurate about its predictions. There was a time when I used to ask the locals about the sunrise and sunset timings. But after being told wildly off the mark timings, I decided that I was better off with an app. After all, the locals have better things to do than simply recording accurate sunrise and sunset timings for tourists! Then comes the question of clicking the sky at every other time. You must have read on countless photography websites that mid day sun is harsh and gives flat pictures. I too agree with that premise. Then generally having scattered clouds in the sky makes for better pictures! 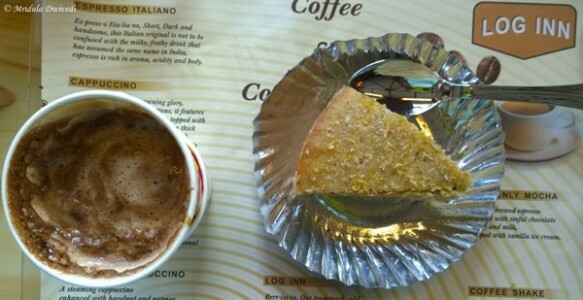 I visited a restaurant by Jhelum in the mid day and after that I was on my way out of Srinagar. So mid day sun or not I had to click a picture. 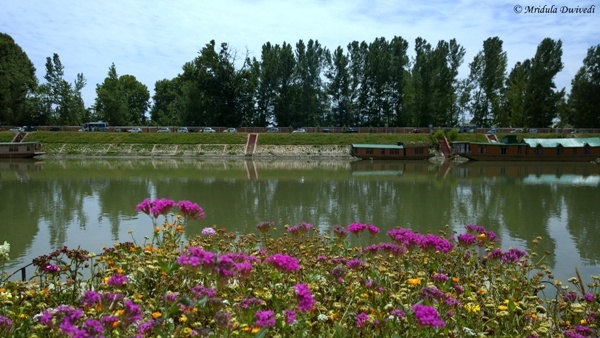 It was helpful that the shore was lined with purple flowers so it added color to an otherwise not too bright scene. PS. This post is part of Sky Watch Friday the community that got me started on appreciating the skies.